I have a thing for clocks, and I have no idea why. lol. I’m a regular at several thrift stores in my surrounding area and I’m always on the lookout for unusual ones… ones that say something to me. 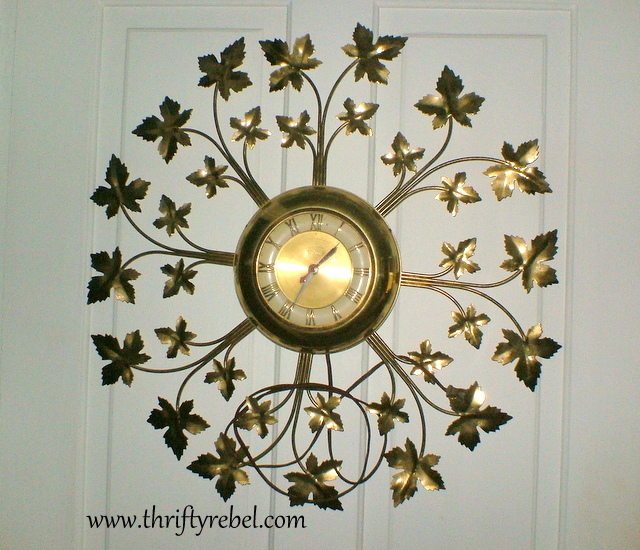 I recently lucked out when I found a large and fabulous vintage gold-toned wall clock for a paltry $5. It’s a plug in, and it even works. lol. I’m not sure how it keeps time yet though but, honestly, I didn’t care if it worked or not. It was coming home with me regardless. If it didn’t work I would have easily found some other way to use it. Here’s a sneak peak of the after. Here’s the before with the electrical cord showing. Oops! 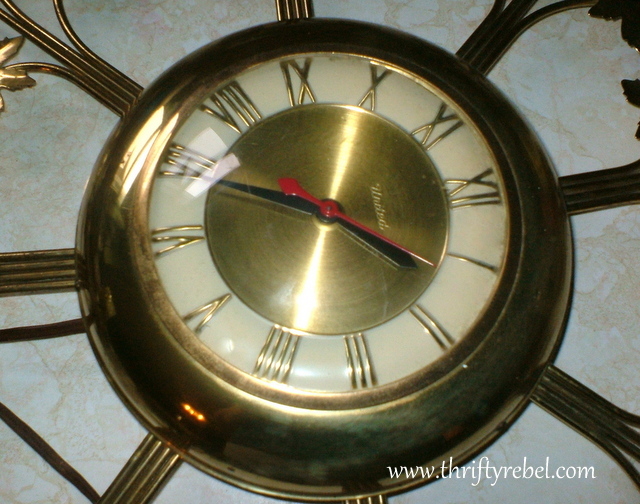 It’s a good size clock, measuring 24″ across, and it was made by United Clock Corp in Brooklyn, NY. It probably dates from the 1950’s. I always do what research I can before I make over a vintage piece just in case I’m painting over a potential retirement fund. According to my research this clock, before painting, could have been worth somewhere between $50-$100 to the right person, but it did have quite a bit of tarnish. So I think it would probably have been at the lower end. So, I felt perfectly safe about giving it some spray paint love. 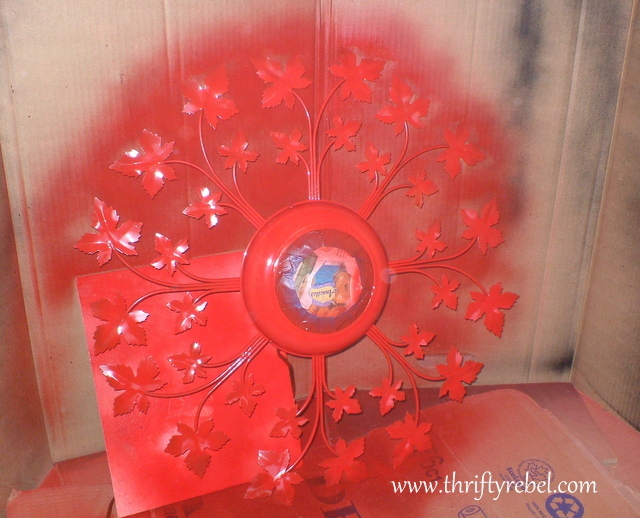 Because of the red hand I decided to spray paint it with a lovely bright red. It was either red or black, so I chose red. I taped off the clock face and took it out to the garage to spray paint. The small piece of cardboard was protecting the cord from getting painted by accident. What… me paint something by accident? As if that would every happen. lol. So… out with the boring gold and in with the sizzling red. Here it is after one light coat of love. And the after… with 3 light coats of paint. Sorry about the flash on the face, but it couldn’t be helped. It wasn’t a nice day to take pics outside. Here’s a better view so you can see the hands. I love this clock! I’m always amazed at what a little spray paint can do. WOW, what a transformation, totally new clock! 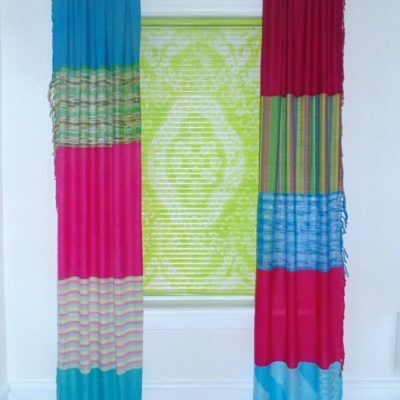 Hello, new fan & co-host of the WTFab blog hop next week! Stopping in to invite you to join me at my Clever Chicks Blog Hop! Thanks so much Kathy! Looking forward to co-hosting the blog hop. I'll be over to check out your hop also. Thanks for the invite… and for following. Wow, I really, really love this. The red is awesome. Thank you so much! I was so lucky to find this clock. Thanks for stopping by. Absolutely outstanding!! I'm in love with this clock. So am I Betty! What a lucky find it was. Thanks so much for stopping by. This clock is CRAZY AWESOME! The red totally makes it modern and fun! Thanks Holly! It was an amazing deal at $5. Thrift stores rock!!! Thanks so mcuh for popping in. Love it! I have to say, your blog is one of the top favorites that I follow. So many good ideas for turning "junk" into treasures. Wow Sarah! Thank you so much! I'm so glad you find inspiration here. I sooo appreciate you reading and visiting. Thanks very much! I love red too. Thanks so much for stopping by and commenting. This is adorable red, I would have walked right past a gold clock like that! Thanks so much for linking up to our Keep Calm & Link Up party, hope you are having a great weekend!! Thanks so much Sarah! It's always fun to join the party. I love it! What a great makeover! Thanks for sharing at Submarine Sunday! Thanks Tonna! It'a always fun to join the party! what a cool project! turned out great! Thanks so much Daniela! I appreciate you stopping by! this is way more fun in the red! Thanks very much! I think so too! Older and original ISN"T always better, or at least that is what I am telling myself this week. I also painted something old and probably devalued it. The thing is, I wasn't going to sell it anyway and it wasn't working for me as it was. Love where you took this clock. Very fun and now a real show stopper. I totally agree with you! Some pieces I don't touch, but I have to love them the way they are or I don't even buy them. 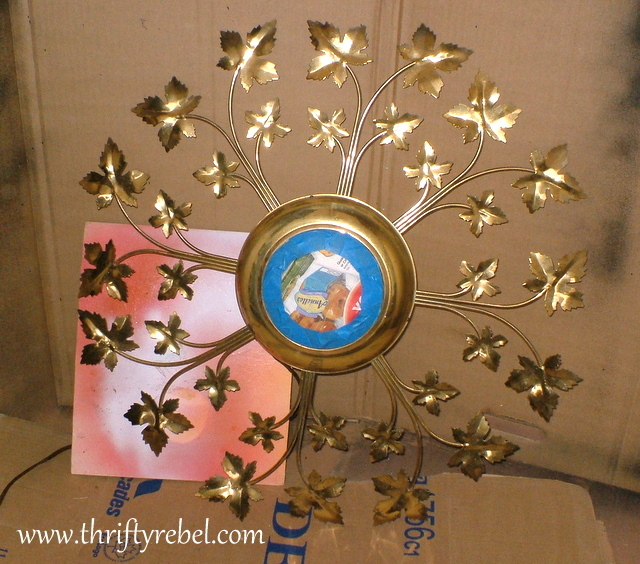 I do tend to fall in love with pieces that need help though. When I find them it's their potential that I fall for… what I envision they could be. And that's the most fun for me. Thanks so much for stopping by! What a great graphic piece – the red against the white is fantastic. I would have painted it, too. Thanks Donna! I really thought this particular piece needed something to make it come back to life. That's what I tried to do with the red. Thanks so much for stopping by! What a great transformation! 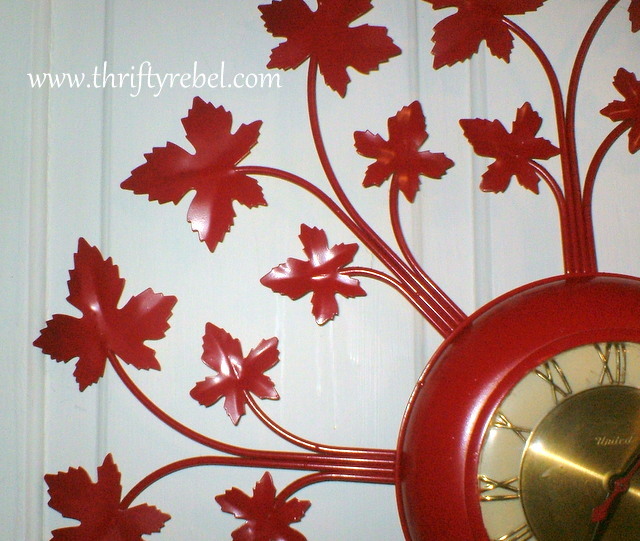 I love red, so this is right down my alley! Thanks so much for linking it to my party! Thanks so much Leslie! I'm a lover of red as well. It's a pleasure to link up to your party each week. Thanks for hosting! Love the new look you gave the clock. Thanks Denise! I appreciate you stopping by! While the before is nice, the red makes it amazing! Thanks so much for sharing on Tout It Tuesday! Hope to see you next week. Thank you so much! It's always fun to join the party! Thanks Crystelle! I wasn't diggin' the gold either, but I knew it could be something special. The red was a natural. Thanks so much for stopping by! I love the red and how good it looks now! Thanks Kaysi! The red hand made the decision to paint it red so easy for me. I'm very happy with the way it turned out. I'm glad you like it too. Thanks so much for visiting! Love the transformation, makes a huge difference! Thanks so much Mel! I appreciate you stopping by! Tuula, Thanks for sharing this fabulous makeover on Simple & Sweet Fridays. 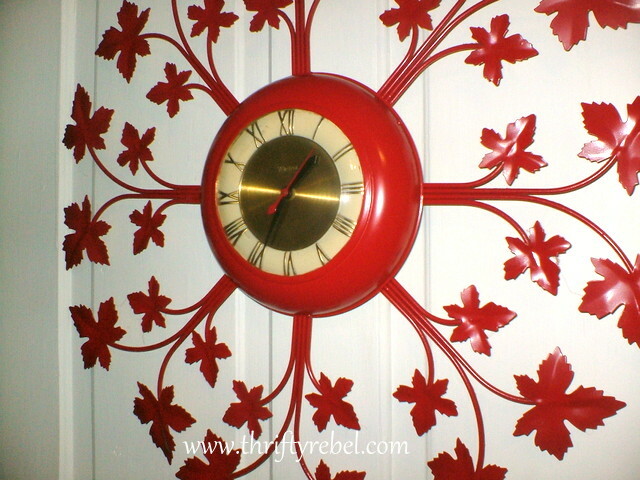 I love the color red, and never would think to paint a clock this color. 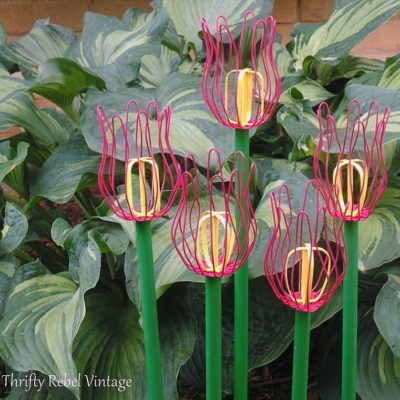 But this one is stunning! Thanks so much Jody! It's always a pleasure to join the party! Thanks so much Kathy! Red is one of my favourite colours. Thanks for stopping by! RED was the perfect color choice! What a cool retro transformation! Thank very much Sharon! I appreciate you stopping by! What a cool and unique clock. Love the red! Thanks Kathie! It was good timing for this makeover too.. the red works perfectly with my Christmas decor. Thanks so much for stopping by! You're a STAR over at I Gotta Create! 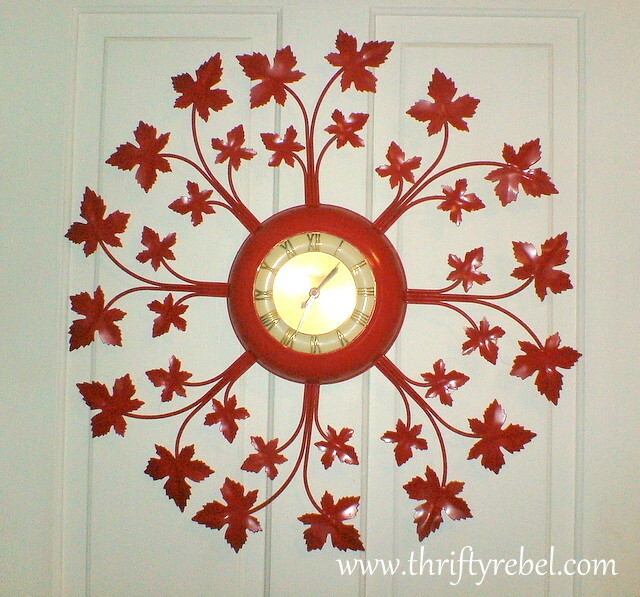 Featuring your red hot clock today. Thanks so much for linking up with the Wildly Original Crowd. Thank you so much Christina! That's so awesome!! Featured your fabulous clock this week! Thanks for linking it up! Thanks so much Margo! I'm thrilled that you're featuring my clock! Love how this turned out. 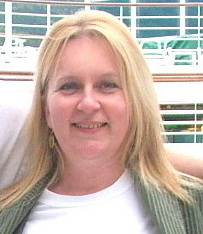 I'm your newest follower from the GFC hop and would love for you to stop by. Thanks so much Kimberly! I appreciate you stopping by and following. I'll definitely be stopping by!